The cars engine and front tires were torn off the car. Careflight takes off with one person who was injured in Sunday afternoon’s one-vehicle crash in the 6000 block of Wright Puthoff Road. The front end of the vehicle was torn off during a crash Sunday afternoon, injuring three teens. 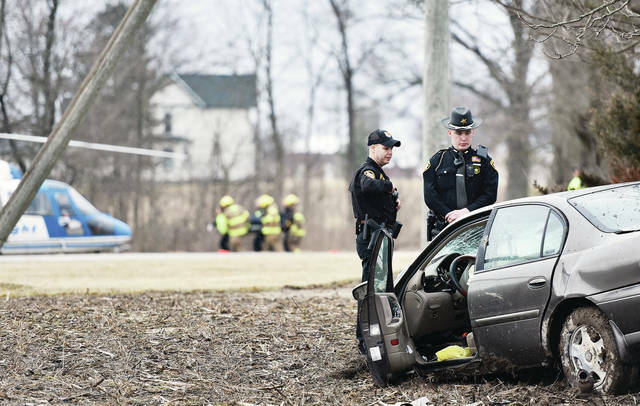 One person was taken by Careflight to Miami Valley Hospital after a car left the road on the 6000 block of Wright Puthoff Road, crashing into a tree which ripped off the car’s engine around 5:30 p.m. Sunday. Two other people in the car were transported to Wilson Health. Two of the people in the car were ejected during the crash. The Shelby County Sheriff’s Office is investigating the one-vehicle crash. The Fort Loramie Fire Department and Fort Loramie Rescue responded to the scene. 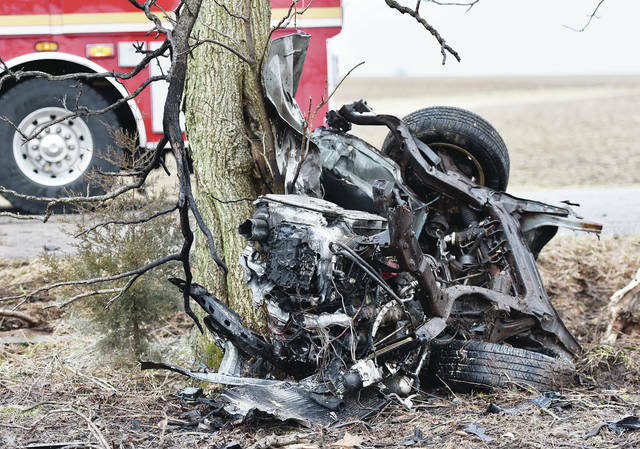 FORT LORAMIE — Three local teenagers were injured when the vehicle they were in crashed into two trees Sunday afternoon at 5:33 p.m. According to the Shelby County Sheriff’s Office, Logan Andrew Cooper, 17, of Fort Loramie, was driving a 2001 Chevrolet Malibu northbound in the 6000 block of Wright Putoff Road when the vehicle went off the right side of the roadway. Cooper over corrected the vehicle and lost control of it. The vehicle rolled over and struck a tree on the left side of the road. Upon impact, the vehicle split in half and continued northbound where it struck another tree on the left side of the road. Cooper and a passenger in the vehicle, Jordan Louis Drees, 17, of Sidney, were both ejected from the vehicle. Neither were wearing seat belts at the time of the crash. Drees was taken by CareFlight to Miami Valley Hospital, Dayton. Cooper was transported to Wilson Health by Fort Loramie Rescue. Both suffered incapacitating injures. 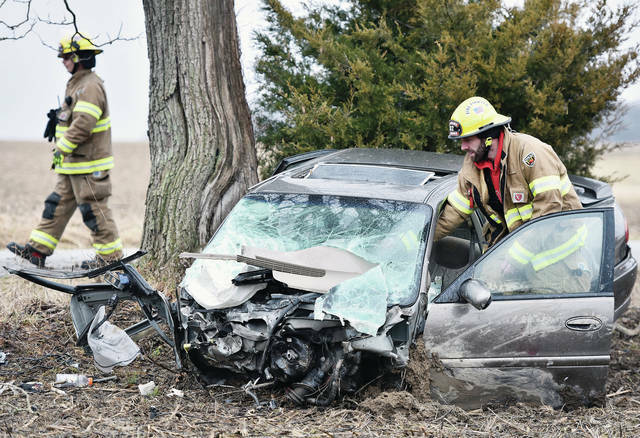 A third person in the vehicle, Layklyn Aubree Kemp, 17, of Piqua, was transported to Wilson Health by Fort Loramie Rescue. She was wearing a seat belt at the time of the crash. Drees was in the front passenger’s seat while Kemp was in the back seat behind the driver. The vehicle, which is owned by David L. Drees, of Sidney, was totaled in the crash. It was towed from the scene by Meyers Towing. A driver, who was going southbound on Wright Putoff Road, witnessed the crash. https://www.dailycall.com/wp-content/uploads/sites/30/2019/03/web1_DSC_9326.jpgThe cars engine and front tires were torn off the car. 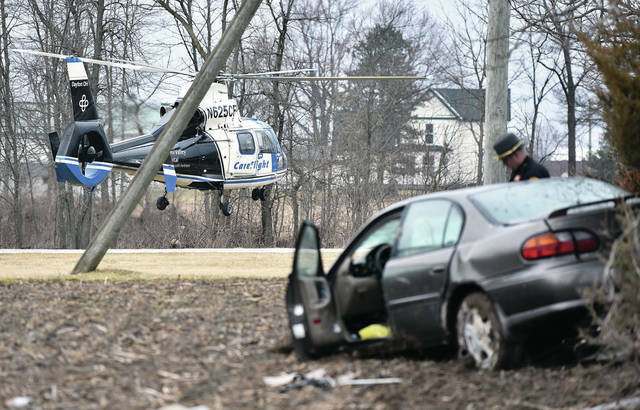 https://www.dailycall.com/wp-content/uploads/sites/30/2019/03/web1_DSC_9351.jpgCareflight takes off with one person who was injured in Sunday afternoon’s one-vehicle crash in the 6000 block of Wright Puthoff Road.